Odense might be best known to many as the hometown of fairy-tale writer Hans Christian Andersen, but the city’s story in recent years has been shaped not by magic, but by science. 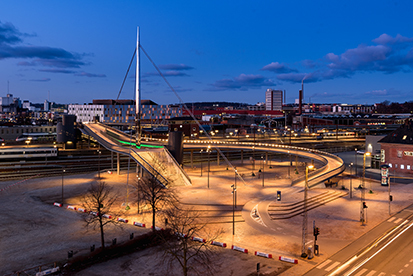 Once a traditional industrial city, Odense is today one of the world’s leading hubs for robotics and drones. In addition to the strength of the cluster, companies also benefit from assistance from the municipality — in the form of, for example, the Odense Investor Summit in September, network events or access to the Odense Robotics StartUp Hub. employees, the main protagonist. However, in the 1980s, in order to compete with low-cost shipyards from Asia, visionaries within the company started to look at industrial robots. This eventually led to a large donation from the Mærsk Mc-Kinney Møller family and the foundation of the Mærsk Mc-Kinney Møller Institute at the University of Southern Denmark. If collaborations within Odense Robotics cluster are more prevalent than within other industries, it is because its members do not typically compete for a small national market. “The unique thing about the robotics cluster is that most companies are born globals – they have the whole world as their market and each focus on their own product area. That’s also why we see a lot of crossover in ownerships and new companies developing new products to extend the application of an existing company’s technology,” explains Nijhoff.